A psychic inflates some balloons. He requests the volunteers to come to the stage and gives them the balloons along with needles. He asks them to prick the balloons with the needles and they all burst. Then he takes a balloon and pierces it with a needle. Nothing happens. Thee balloon retains its shape. Effect: Piercing a balloon without it bursting. Props: Balloons, sharp long needles, transparent cellotape and Vaseline. Method: On the balloons which you are going to pierce with needles, stick a small piece of cellotape at both sides. Pierce the needle over the cello tape and it won't deflate. Or apply Vaseline on that portion. Gum on the cello-tape and the Vaseline seals the air from escaping. Another method is to prick me balloon at the top or bottom and the outside air pressure keeps it intact. Have you ever seen someone pop a balloon with a needle? Is it possible to stick a needle through a balloon without popping it? Blow up a balloon – not too full – and tie the opening shut. Dip the tip of a skewer in Vaseline and spread the Vaseline along the entire length of the skewer. If you are careful, you should be able to push the skewer all the way through the balloon without popping it. Insert the skewer with a gentle twisting motion into the end of the balloon opposite the knot. Continue pushing and twisting the skewer until the tip emerges from the other end, near the knot. Why doesn't the balloon pop? Now try to stick the skewer into the side of the balloon.What happens? The rubber in the balloon consists of many long molecules that are linked together. It's similar to the way all of the noodles in a plate of spaghetti stick together. These long molecules are called polymers; when molecules of a polymer are chemically attached to each other, it is called cross-linking. These links hold the polymer molecules together and allow them to stretch…up to a point. When the force or tension pulling on the cross-links is too great, they will break, and the polymer will pull apart. Look at the rubber near the ends of the balloon where you first inserted the skewer. Does it look lighter or darker than the rubber in the rest of the balloon? The rubber at the ends of the balloon is stretched out less than in the middle of the balloon. Therefore, there is less force pulling on it. This allows the tip of the skewer to break some polymer cross-links, push aside the molecules of rubber, and slide into the balloon. However, enough cross-links remain so that the balloon holds together. In the side of the balloon, there are fewer polymer molecules. When you push the tip of the skewer through the rubber in the side of the balloon and the skewer breaks a few of the cross-links, the tension on the remaining cross-links is too great, and the balloon pops. Do you think there is a way to stick a sharp pin through the side of a balloon without popping it? Put a small piece of cellophane tape on the side of the balloon and press it down well. Now take the pin and press it through the tape and into the balloon. Does the balloon pop? 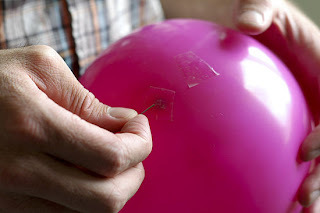 The tape sticks to the rubber in the balloon and will not allow the rubber to stretch to the breaking point when the pin pierces the balloon. In other words, the tape reinforces the cross links, and the balloon stays together.